I am a contemporary textile artist in Memphis, Tennessee. 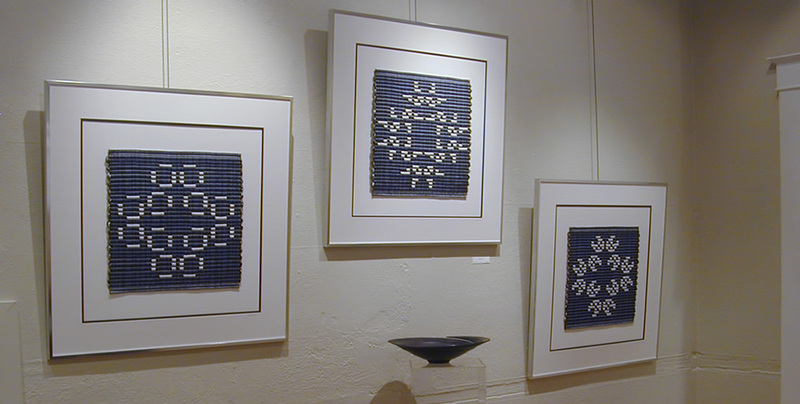 I blend technical influences into my creative work, using weaving as a canvas for exploring codes and patterns. I have a degrees in engineering and math, plus a Master of Fine Arts and a Master Spinner certificate. I have always bounced between analytical and creative pursuits. I spent 20+ years in the tech industry as a programmer, network engineer, and trainer. I have worked with some form of textiles since childhood, starting with embroidery and cross stitch. I learned to knit in high school, learned to spin in 2000, and started weaving on a multi-shaft loom in 2004. I learned the basics of weaving from a book and have since taken numerous workshops on a wide variety of special topics. 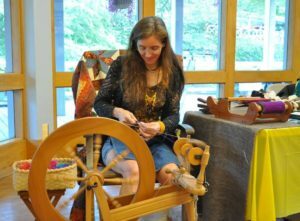 I am primarily a weaver, but also a spinner, knitter, and enthusiast for all textile structures from the common to the esoteric including braids, basketry, and off-loom weaving. My favorite techniques allow me to create geometric patterns and improvise at the loom. I often use math and language as a design source, encoding a story into an original textile. I select materials, color placement, and other details with additional meaning. I occasionally go to the other extreme, working without a plan for the finished item, looking only as far as the next step and letting the materials guide the process. One of my greatest joys is enabling other people to experience the joy of creating. 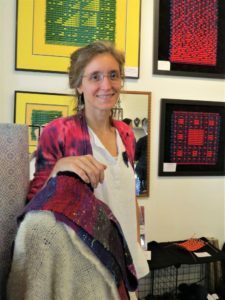 I teach multiple fiber arts as well as math, computer science, color theory, and social dance. I regularly teach in Memphis and the surrounding region, and at the John C. Campbell Folk School. I am on the board of Tennessee Craft Southwest, Complex Weavers, and Memphis Contra Dance, and am a member of the Memphis Guild of Handloom Weavers, Southeast Fiber Forum Association, Handweavers’ Guild of America, Tablet Weavers International Studies and Techniques (TWIST), Country Song and Dance Society, and Red Hot Lindy Hop.